IC Markets Reviews 2019 - Forex Rank's Top Broker For 2019, Why? Overview: Australia-based, ASIC-regulated IC Markets is one of the biggest forex brokers, and has a good reputation for efficient platforms and support system. They have offices in Sydney and offer a number of flexible choices for trading. 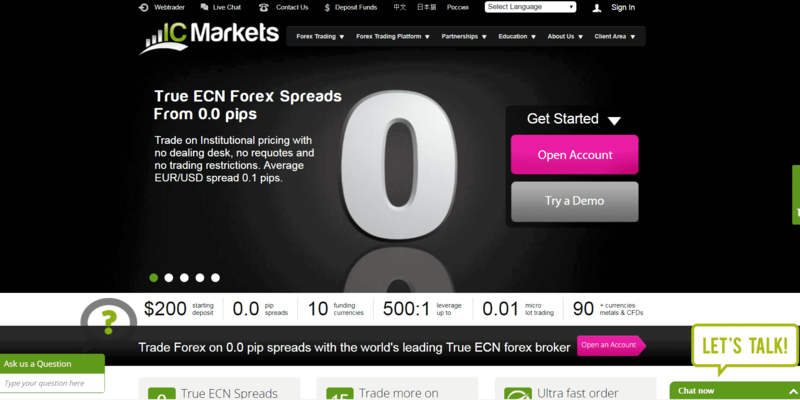 Accounts: Traders can sign up for standard accounts, True ECN accounts, cTrader ECN as well as Islamic swap-free accounts. All accounts are segregated with Australian banks. The IC Markets Multi Account Manager lets money managers and experienced traders enjoy reporting in the real time with fund allocation and performance monitoring through one user-friendly interface. You can trade over 90 currencies, metal and CFDs. Features: IC Markets gives you a total of 10 platforms to trade on, including MetarTrader4, the new MetaTrader5, mobile platforms, cTrader and autotrade services like Myfxbook and ZuluTrade. These services let you copy trades in any system to your IC Markets MetaTrader 4 account, free of charge and with no need for downloads. With the True ECN connectivity the brokers offer tight spreads, access to interbank liquidity and fast execution. Education: News, market reviews, calendars and calculators, as well as video tutorials are available. Deposits/Withdrawals: Deposits accepted in ten different currencies, through fourteen fund transfer and payment options. The withdrawal form is processed quickly and withdrawals are received anywhere between 1 and 5 working days. Customer service: 24/7 via online chat or email. Is IC Markets FCA regulated ? No. IC Markets is only regulated under ASIC which stands for Australian Securities and Investments Commission. Is IC Markets legit ? What makes a Forex broker “legit”? We see legitimacy as having a good reputation, years of experience and the proper regulations. IC Markets hit all these parameters. IC Markets is “legit”. Does IC Markets accept US clients ? The answer is no. Strict US regulation forbids US citizens to have overseas Forex accounts. Is IC Markets a market maker ? They are a True ECN connectivity the broker. Which makes them a ECN type broker. IC Markets ESMA Will they be Affected ? No. ESMA will only affect brokers within the European Union. IC Markets headquarters is in Australia and falls under the Australian regulator ASIC. User reviews: Check out more IC Markets Reviews below. IC markets is one of my favourites. Nothing bad to say really. ICMARKETS is by far the best broker I have traded with over the past 8 plus years. Excellent execution and flawless customer service. Excellent all around. IC is a Fair broker. I got ripped off by a bogus broker recently it was a hassle to get a withdrawal, I had to hire a recovery solution company to get my funds back. Glad this is finally over for me. Gostaria de uma dica de como depositar fundos na IC partindo do real.